If we live alone, then we know how dull the house chores can be. After a tiring day at work, the last thing we need is to start vacuuming. Likewise, on Sunday, which is our only day to relax, our house chores can become a nightmare. That's where a robotic vacuum may come in handy. If we're short on money and we can't afford the premium Xiaomi Mi, then we can get the affordable ILIFE V7. Here's our detailed review. To ILIFE or not to ILIFE? What is your opinion about ILIFE V7? 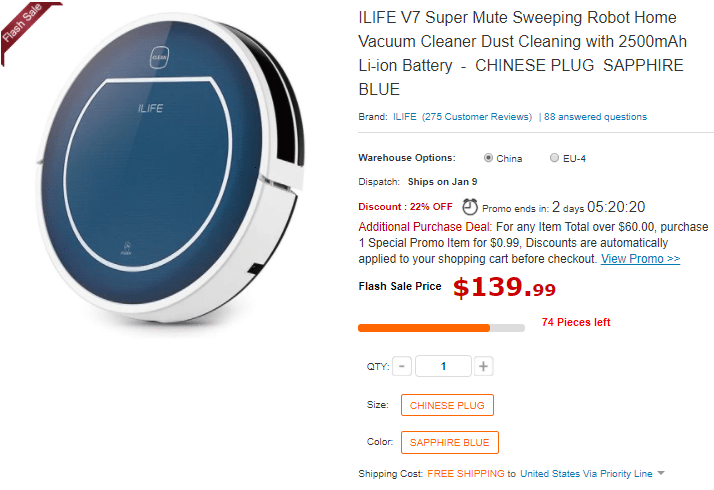 In contrast with Xiaomi robotic vacuum, ILIFE V7 doesn't have room mapping sensors. This lowers the cost, but the vacuum still does an excellent job cleaning. 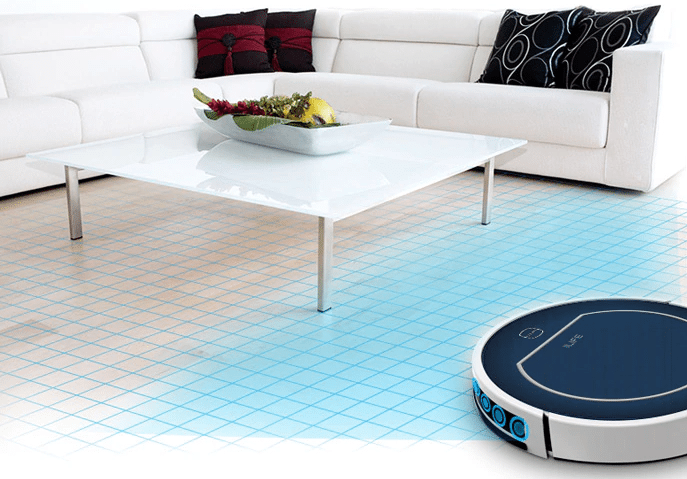 The vacuum can sensor the obstacles and maneuver seamlessly between them. With ILIFE V7 we will wipe every corner of our house, as well as mop the floor with the help of the dry cloth. 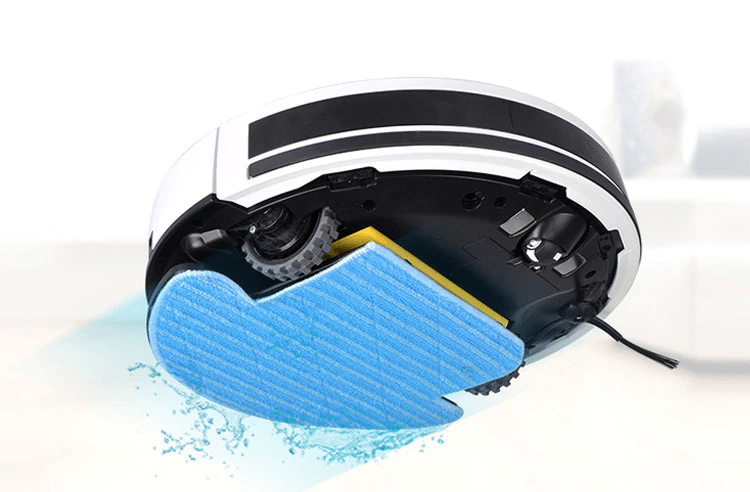 The PRO version can mop with water since it has a water container. The vacuum can climb up to a 10-degree slope, and it's silent to 50dB, while an ordinary vacuum has about 90dB noise. The lower noise on ILIFE allows us to schedule the vacuuming even when we are asleep. Also, we are never going to see our robot do a free fall from the stairs since it has cliff sensors. On the inside, it has a battery of 2500mAh, which - according to the company - can last up to 2 hours and cover 1600 square feet with one charge. When the battery runs low, our vacuum will automatically go back to its dock to start charging. The device has a remote control, but also it syncs with the ILIFE app. The box is plain, with a demonstration of the vacuum and the QRcode to download its app. 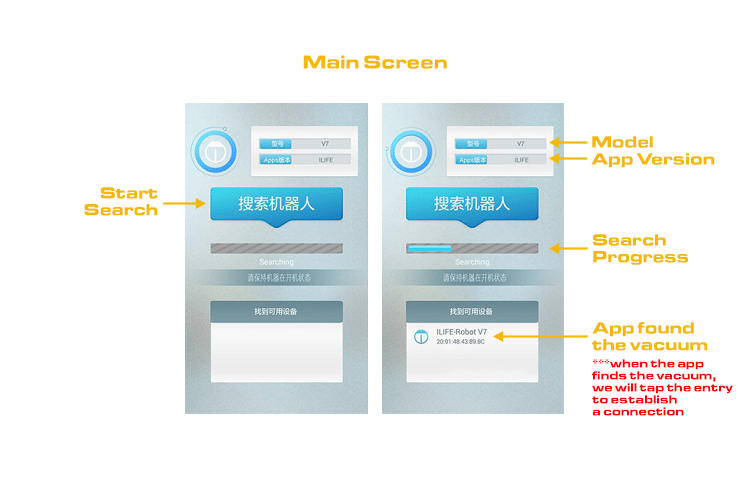 On the back side, we see the icons of ILIFE V7 functions and for one more time the app's QRcode. 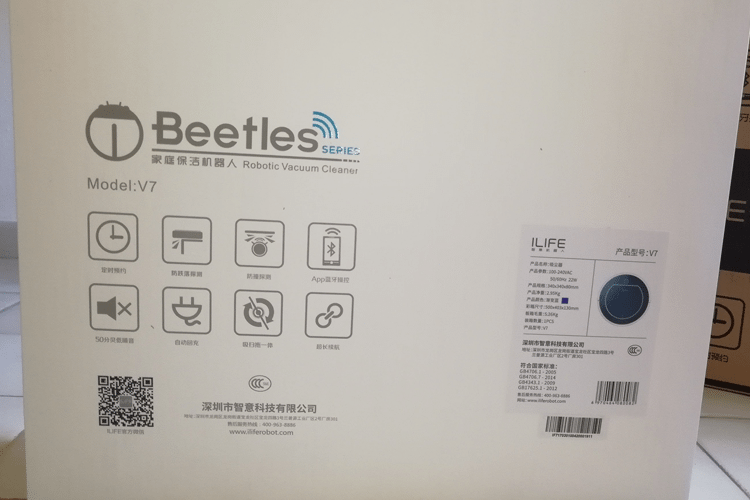 When we open the box, we see a manual in Chinese, but also in English. Under the manual, we have our vacuum wrapped, and other accessories also wrapped. The accessories are the charging dock, the charger, the remote control, batteries which lasted for two days, and the dusting brush. Additionally, we will find more spare parts: a side brush, two filters, and a mopping cloth. The most prominent part on the top of the robot is the lid. By pressing slightly, we open the lid, where we will find the can. On the bottom part, we will find the mopping cloth, the side brush, and the cleaning roller brushes. With a quick glance, we realized it's a very stylish vacuum. The dock is tiny, and you don't really notice it. The weight of the vacuum shows a steady structure, without making it hard to carry around though. 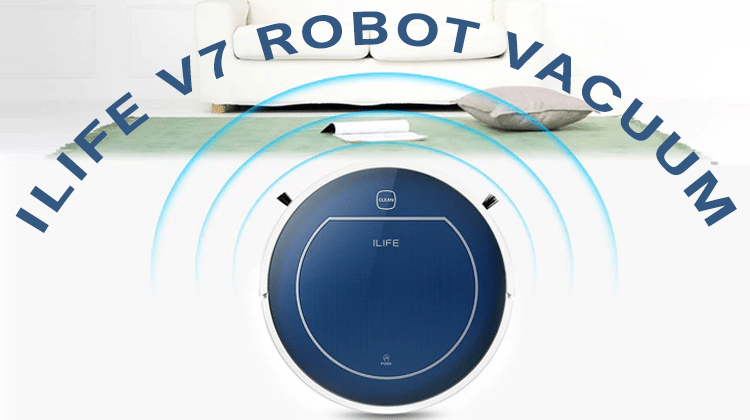 Same as most robotic vacuums, ILIFE is also round with a glossy finish. On the front part, it has the obstacle sensor, which covers most of the facade. The can is easy to remove, and we can either clean it with the dusting brush or by washing it with lukewarm water. When we connected the dock to an outlet and pressed "CLEAN" on the top of the robot, we heard a distinct sound indicating it was ready to clean everything. In general, our first impressions were positive, and we didn't find any cons. We were also particularly happy with the numerous spare parts the company included. ILIFE saves us from stooping to press the "CLEAN," by offering us a remote control and an app for our vacuum. 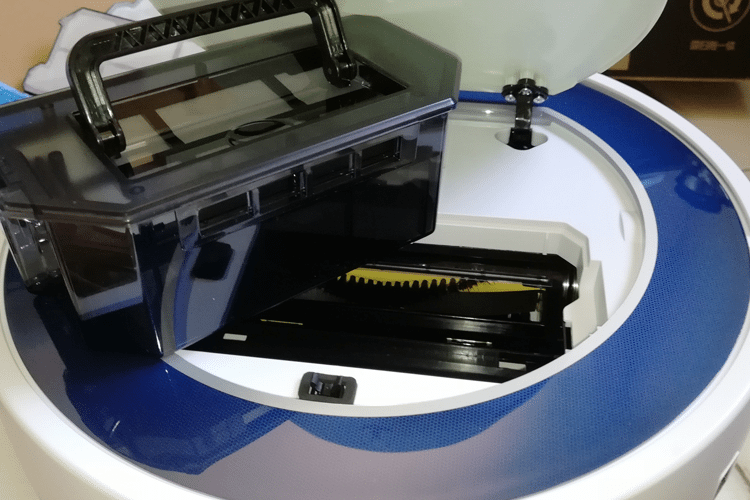 Operating the vacuum through the remote is very easy, apart from the arrow buttons that change the direction of our vacuum since we can't long press them. The dock must be connected to power to receive any commands. So when we plug it in, we can start by setting the current time. 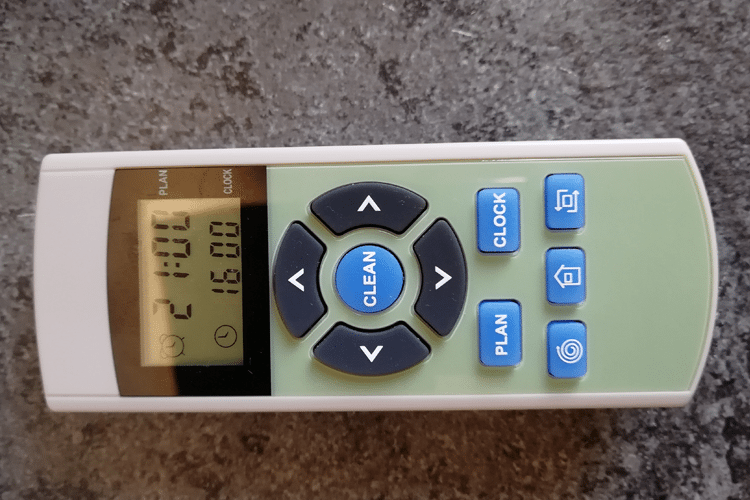 We press the "CLOCK" button, and with the arrows, we change the hour and the minutes as we see on the remote's screen. When we are finished, we press the "CLOCK" again, and we will hear a distinct sound from our device notifying us that the setting is saved. 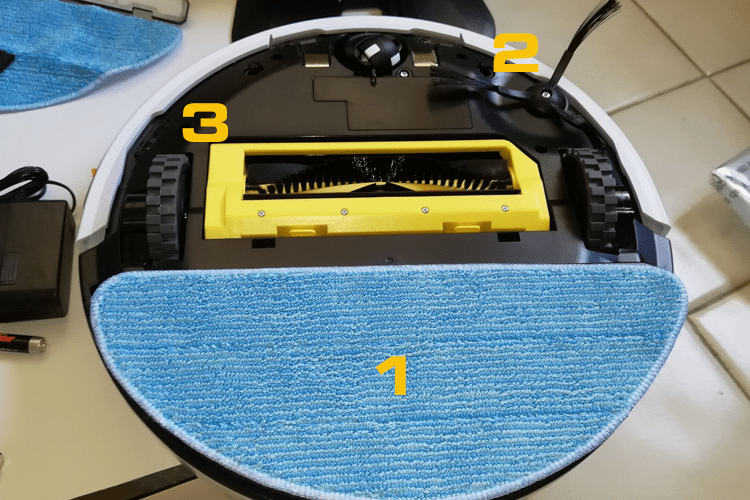 With the "PLAN" button and the arrows, we can set the time we want our robot to start vacuuming automatically. Apart from the scheduled cleaning, we can start cleaning by pressing the button "CLEAN." In the middle of the remote, we have the arrows, which change the direction of the vacuum. On the bottom, we find the function buttons. 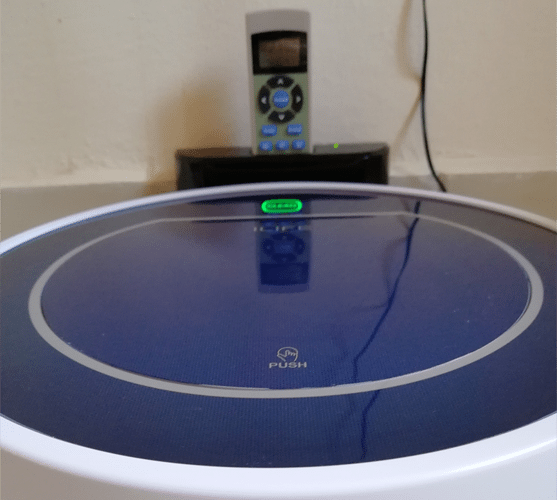 With the spiral button, we set our vacuum to spot cleaning. The house button sends the robot to its dock. Lastly, the third switch makes the vacuum perform only near the walls. In case we want something more technologically advanced, we can scan one of the many QR codes. It will download the ILIFE app, which lets us control our vacuum through our phone. 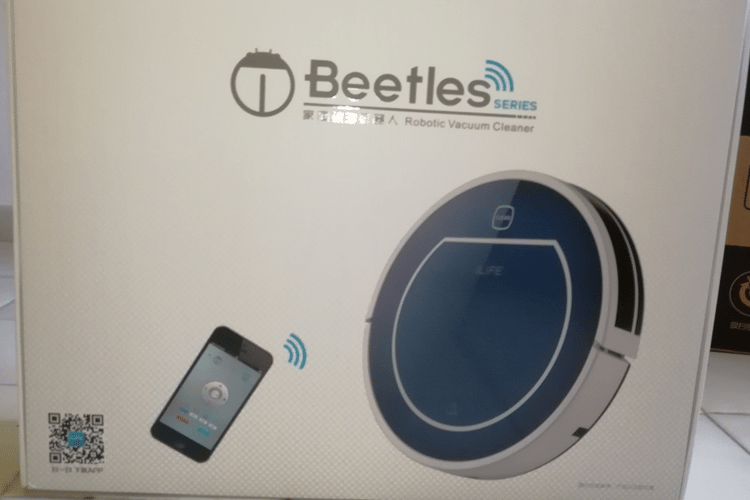 After we download the app, we open the vacuum and our device's Bluetooth. Next, we press the blue button to start searching for compatible devices. No, we didn't learn Chinese to do this review. 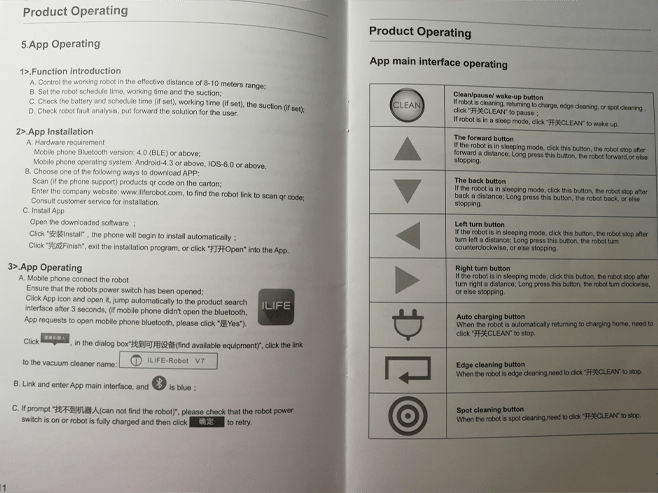 The company instead of translating the app decided to give us instructions on the manual. We, as you saw in the screenshots, translated the app for you. 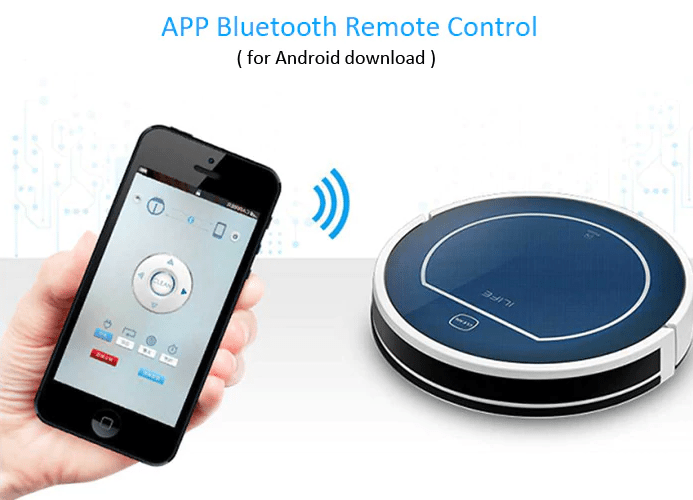 The UI is very similar to the remote, apart from the Chinese. The only difference is that we don't have the "PLAN" and "CLOCK" buttons. 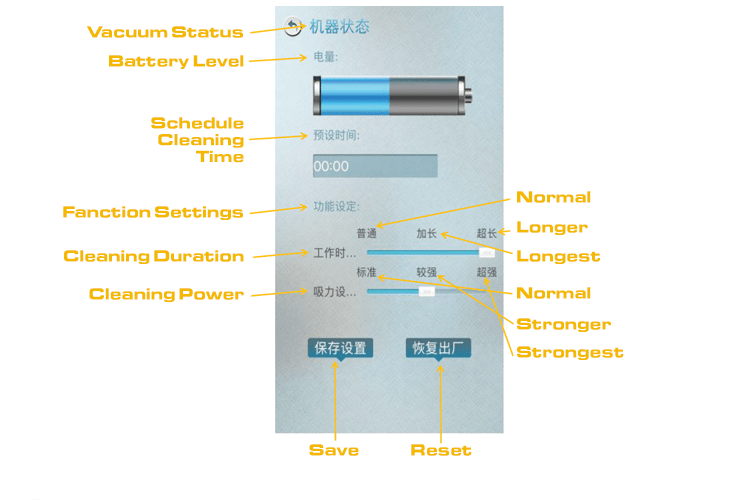 The vacuum automatically synchronizes to the time and date of our phone. 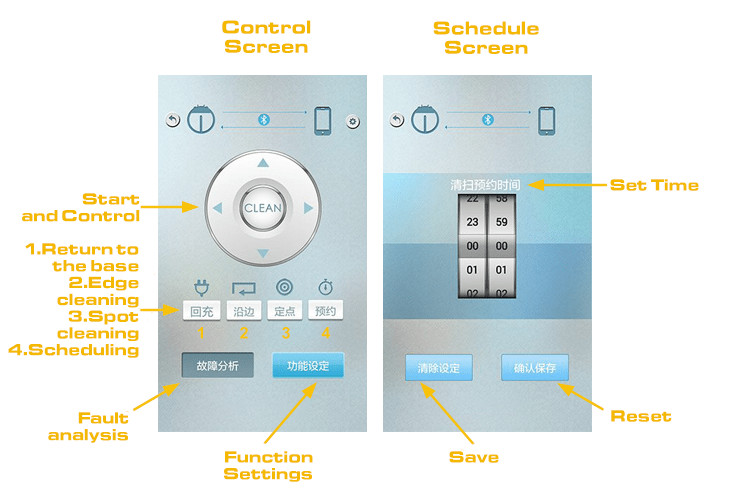 To set the scheduled cleaning time, we press the fourth button and get transferred to a screen to set the time. Through the app, we can set how long we want the vacuuming to last, as well as how intense we want the cleaning to be. The positive thing is we don't have to stay connected to a Wi-Fi network for the app to work. However, we do need to keep guessing what everything means - until the app gets translated, at least. 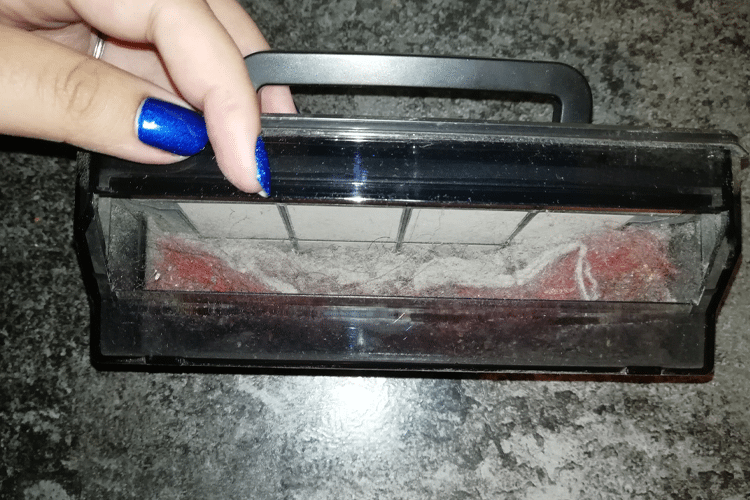 After we set everything, we couldn't wait for the scheduled time, so we merely pressed "CLEAN" to see how the vacuum performs. The robot started immediately sweeping around our space. When it was on a corner, it stayed there a bit longer to make sure everything was getting cleaned. The route it took looked a little random, but after a while, not a single tile remained dirty. It surpassed every obstacle, and it even went through the wheels of our office chair, which left us speechless. Nonetheless, we must let you know that it isn't a fan of long hair carpets. Within 30 minutes, our 380 square feet apartment was clean, so there was no reason to let it clean any longer. After that, we sent it right back into its dock. It's self-explanatory that for larger spaces it needs more time. The sure thing is the 2-hour battery life is more than enough, and it goes back to its dock all by itself. When the robot goes back to its dock, it makes a distinct sound. If we don't hear the sound, then it didn't "park" properly. In that case, we simply press "CLEAN" and then we press the home button to make it return to its dock once again. When the battery is almost or empty, then the "CLEAN" button turns orange or red. We will understand that it's fully charged when the light turns green and stops flashing. The vacuum made our floors literally shine, and it was the most pain-free cleaning we ever did. 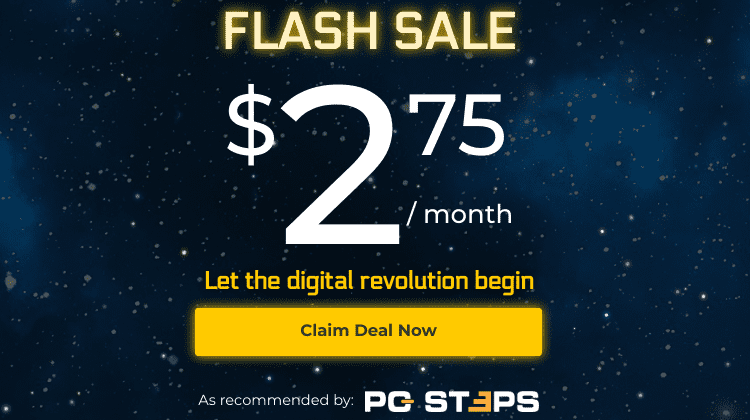 We can buy ILIFE V7 from the Gearbest international e-shop for $140 with free shipping. In case we need more spare parts, we can get them from here. After using the vacuum for a few weeks, we can say that we are thrilled with the results and we recommend it without any hesitation. ILIFE cleans flawlessly, without leaving any trace of dirt behind, and makes the floor shine with the mopping cloth. 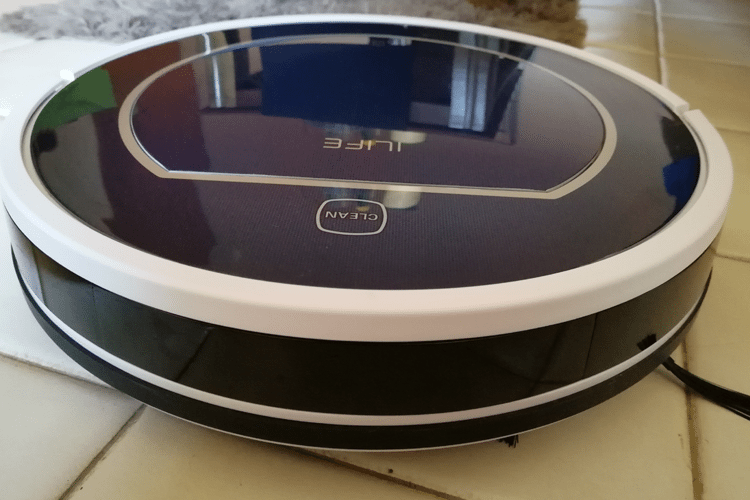 It might not map our space as Xiaomi Mi does, but it doesn't lack at all in cleaning since it can find its way even through the toughest obstacles. The spare parts the company offers are a huge plus for its value, and the remote compensates for the Chinese app. 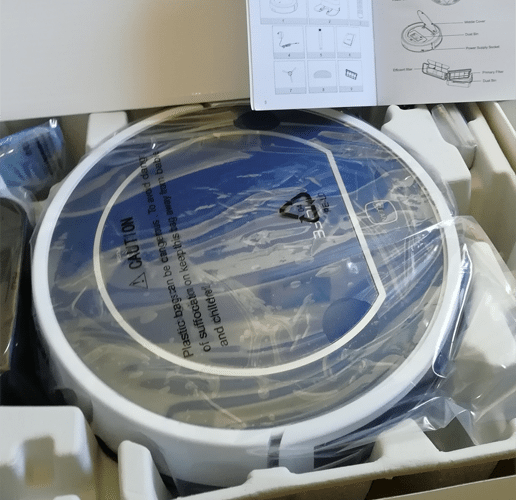 If you are in the market for an affordable robotic vacuum for a small or medium place, then this is the ultimate VFM. Below we summed up the pros and cons we found while using the ILIFE V7. Do you trust robots or are you afraid they will take over the world? 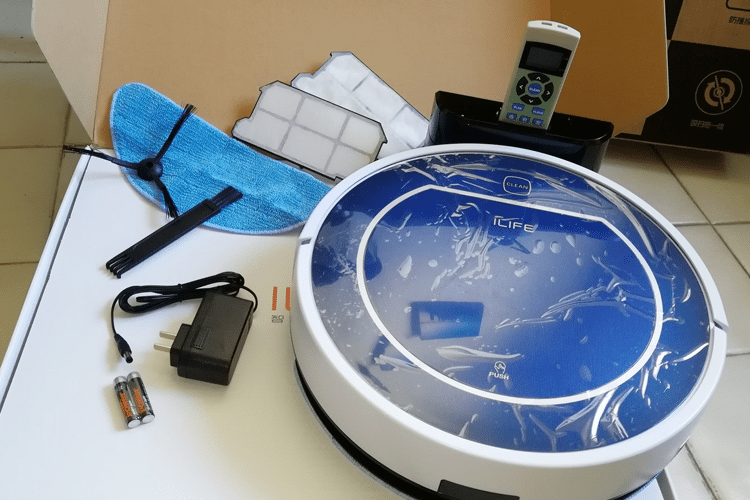 Will you buy a robot to do the house chores for you? Would you choose the affordable ILIFE V7 instead of a more expensive model as Xiaomi Mi? For more information, leave a comment below.